Veneto is home to a stunning heritage of Renaissance architecture. There are over 4000 palladian style villas spread all over the region. The scholars talk of a out-and-out Veneto villa culture. It does not matter whether you are keen on architecture or not: many Veneto's Renaissance mansions are tucked away amongst gently rolling hills or in the countryside, often immersed in beautiful natural settings, or close to significant cultural and wine-and-food itineraries. So, if you are planning a relaxing getaway in Veneto, you may want to go for it. Veneto is a small land and you can easily choose an itinerary and follow it in a few hours, this way covering a lot of interesting attractions and things to see. For example, you could follow a route driving for a couple of hours, stopping off and visit both some Palladian villas and ancient towns like Verona or Vicenza. Just pay attention to the fact that in many Veneto’s main highways the traffic can be heavy during daytime. If you like strolling around, read here about a pleasant pedestrian itinerary in the historic center of Vicenza, discovering the great Palladio architecture heritage. 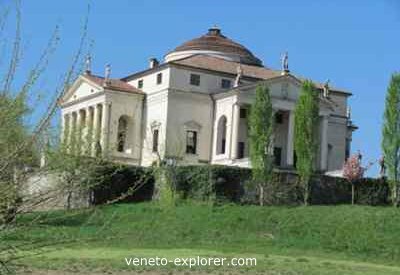 With the sixteenth century Veneto’s architect Andrea Palladio (1508 – 1580) a new type of mansion was born: the temple-villa. His revolutionary architectural design has influenced the world, having a profound impact on the architectural style for over a century in England and, through Thomas Jefferson and the architect Alexander Jackson Davis in the USA too. See, for example, the White House and the President Jefferson’s home Monticello at Charlottesville, Virginia (which by the way is the only historic house in the U.S.A. on the United Nations' World Heritage List). If you are curious, search for Italianate style and you will find many examples, especially in the US and U.K. In Veneto, those elegant mansions were built over a couple of centuries, between the 1500s’ and 1700s’. What were those great renaissance architecture villas for? In the 1500’s the aristocrats and wealthy merchants from Venice started a new trend: the building of more and more elegant farmhouses-mansions in the countryside and hills of Veneto, in order to both escape the hustle and bustle of the city life and to better manage their promising farming business. Their inspiration was the Palladio architecture, with its careful pursue of aesthetical harmony and classical symmetry. The architectural style of the Renaissance, unlike the previous gothic style, emphasis on proportion and symmetry, just like in the ancient greek and roman buildings. 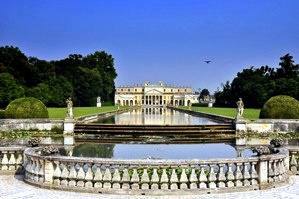 In fact the plan of the Palladio style mansion is usually a perfect interaction between the main central building that is the manor house, and the two symmetrical wings astride, named barchesse, which were used as stables or as accommodation for the farmers. This itinerary runs through Vicenza and its surrounding hills, alluring natural settings ideal for riding horses, bicycling and hiking, and for wine tasting stopovers. It starts from one of the most famous examples of Italian renaissance buildings, that is the Villa Capra Valmarana, in Vicenza, also known as La Rotonda, dating back to the second half of 1500s'. It is the last masterpiece of Andrea Palladio, considered one of the most significant of all the Veneto villas for its extreme symmetry. Then the itinerary continues towards the enchanting Berici hills, in the villa Garzadori da Schio, digged into the rock and immersed in a romantic seventeenth-century park. Another pleasant and relaxing itinerary west of Vicenza, toward magnificent villas surrounded by romantic old gardens. Another getaway into the Italian Renaissance architecture: you'll admire the first villa designed by the great Andrea Palladio, plus other magnificent villas surrounded by big romantic gardens, all of them embraced by a hilly landscape. In the province of Padua, partly immersed in a still bucolic landscape, get to know some of the most unusual and beautiful villas of Italy like the villa Emo Capodidilista and the villa of the Tuscan poet Petrarca, dating back to 1300s', located in the enchanting medieval village Arquà Petrarca. Dip in a unique way into Renaissance architecture and enjoy a classic boat trip sailing along the river Brenta, between Venice and Verona, where lie some of the most famous ancient Veneto villa - one of them designed by Andrea Palladio - which belonged to powerful families of the Republic of Venice.